← Government of Iran Orders identification of all Baha’i Elementary and Preschoolers! How Far Iran Is Behind the Rest of Humanity Because of Its Inhumanity? The answer is as far as one can imagine! It is hopeful to see that the world is recognizing the vital significance of the principles of Baha’u’llah’s Revelation for the healing and survival of humanity and hoping to embrace the oneness of all humanity, equality of women and men, peace, harmony of science and religion, and independent investigation of truth, to mention a few. It is also most disheartening to witness that Iran, the birthplace of Bahau’llah and the Baha’i Faith, in 1844, is amongst the darkest corners of our planet. While the rest of the world is crying out for oneness of all humanity, unity of all people, and peace amongst all nations and religions, the Islamic Republic Regime of Iran is leading a campaign of repression against the Baha’i Faith. 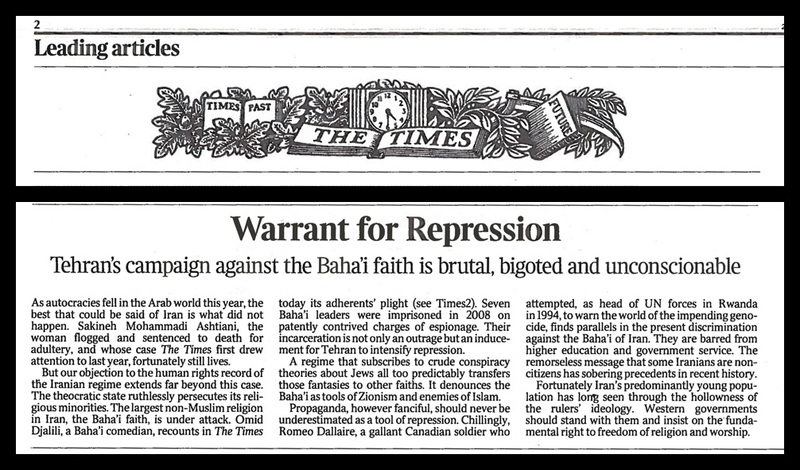 In an article The Times headlines reads; Warrant for Repression; Tehran’s Campaign Against the Baha’i Faith is Brutal, Bigoted and Unconscionable. The Internet is riddled with pictures of once most verdant and beautiful Baha’i cemeteries destroyed and desecrated by the Islamic Republic Government of Iran. In most civilized cultures of the world, the respect for the dead is a foremost sign of humanity, culture, and godliness. It is hard to believe that any religion be a representation of the All Loving, All Compassionate, All Merciful God and teach so much hatred, destruction and deceit! talk to your representative about it. Suggest some more helpful actions. This entry was posted in human rights, Questions and tagged human rights violations in Iran, oneness is universal, Persecution of Baha'is in Iran, to do list about human rights violations in Iran. Bookmark the permalink.